So what happened was a few weeks ago, I noticed some weird oval lines appearing at the top of my E7270’s screen. At first, I thought I had accidentally damaged the screen, but after some more observation, it seemed to me that those lines were appearing underneath the glass of the screen. It looked like air bubbles are appearing between the glass and the pixels, and a few more bubbles appeared during the next few day. 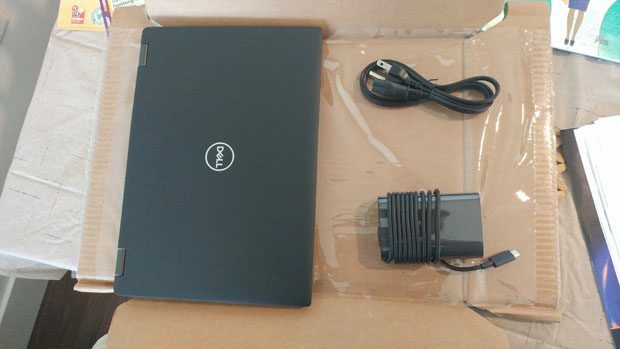 Since this was a Dell Business laptop, it is covered by 3 years of warranty (instead of the usual 1 year for consumer models), so I called up Dell for help. 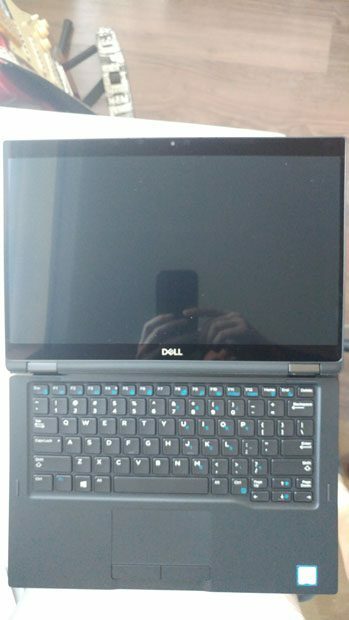 At first, Dell had offered to send a technician to fix the screen, but then they found don’t have the parts due to the age of the model, and won’t have the parts for months. 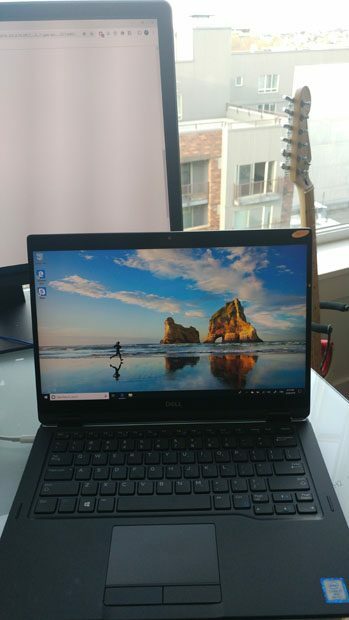 In light of that, Dell offered to exchange my laptop for a newer model with equivalent or better specs, and of course I agreed. I didn’t need an upgrade at the moment, but I certainly won’t say no to one when it comes at no extra cost. 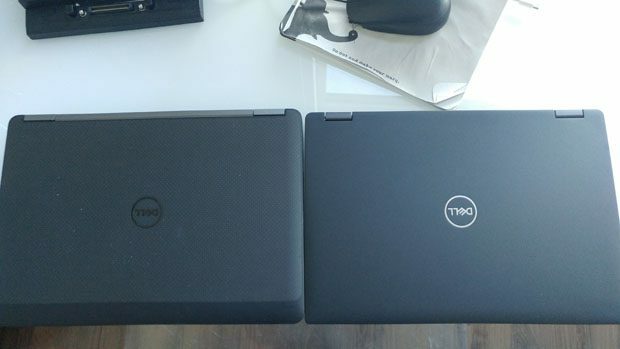 A few days later, I received the replacement laptop in the mail and did a little physical comparison to the E7270. 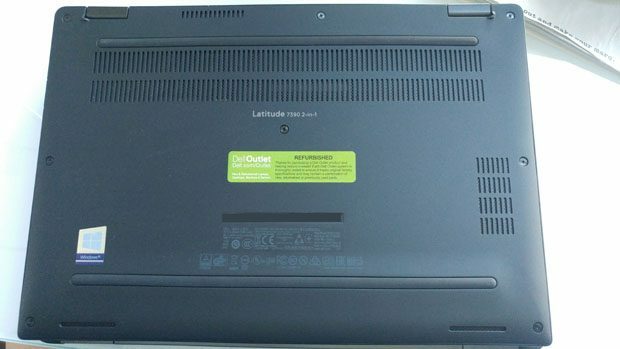 Like the Latitude E7270 I bought, the 7390 2-in-1 is also a refurbished unit. 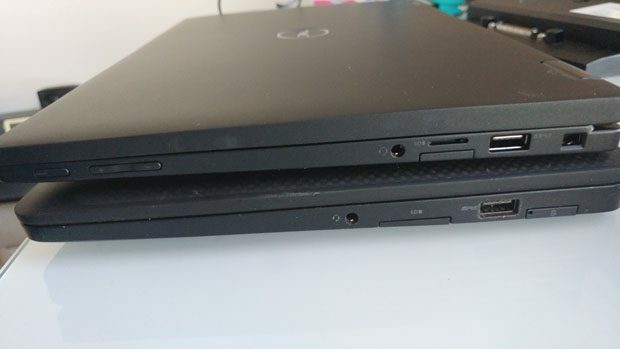 The physical dimensions of the two laptops are quite similar as seen in the pictures below. The 7390 is slightly heavier, weighing in over 3.12 lbs as compared to the 2.77 lbs of the E7270, but it’s still in ultrabook territory. The 7390 as a darker finish than the E7270, but they both have the no-nonsense business styling of the Latitude product line. 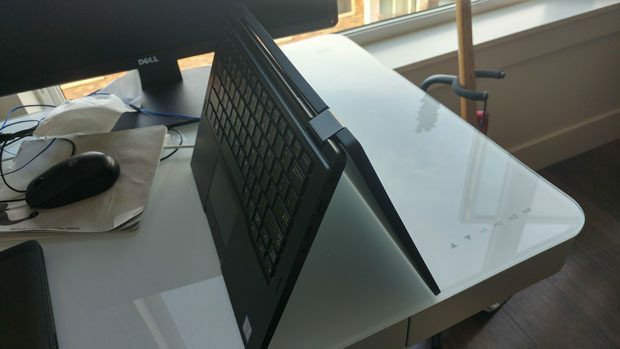 The biggest difference when handling these ultrabooks is that the lid (screen portion) of the 7390 is about as thick as the bottom, while the lid on the E7270 is thinner than the bottom. This is probably because the 7390 is a 2-in-1 unit that can fold completely over into a tablet, while the E7270 is a regular laptop. I haven’t used the tablet mode very much at home, but having the option is better than not having the option. Despite having approximately the same dimensions as the E7270, the 7390 has a larger 13 inch screen, thanks to considerably thinner bezels. It’s a full HD (1920 x 1080) touch screen, and so far it’s comparable in quality to the E7270. Like my E7270, the replacement 7390 has 16 GB of RAM and a 512 GB SSD for storage, but the CPU has been updated to a Intel Core i7 8650U quad-core processor and with updated Intel integrated graphics. This definitely translates into better performance, although I don’t do much heavy-lifting with my home laptop these days. The 7390 also has a different set of ports as compared to the older E7270. 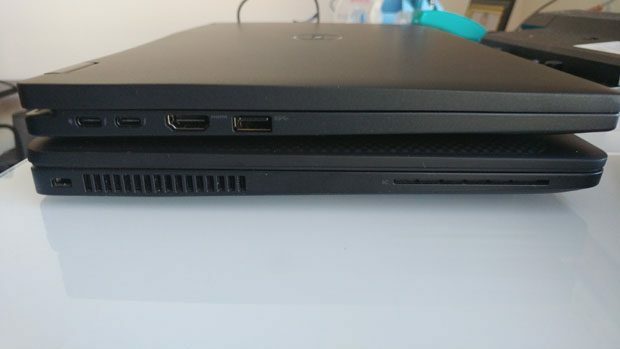 The 7390 has two USB ports and two USB-C ports (one of which is also used to supply power to the laptop), plus HDMI, microSD, and audio combo jack. 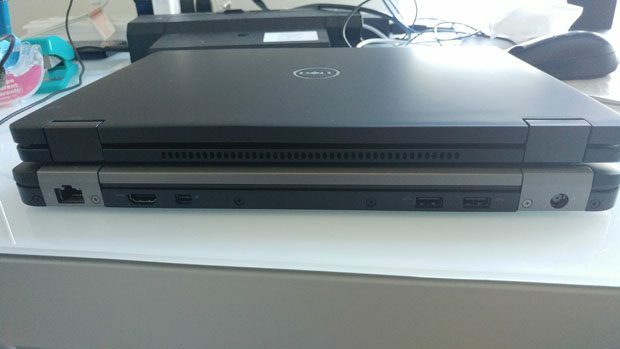 With the adoption of USB-C, Dell has ditched its signature E-port, which means I can no longer use the E-port docking station with it. Now I have a a port shortage since my peripherals now occupy all the ports except one USB-C port. There is also no Ehternet port.I might have to get a new docking station somewhere down the line. Back side comparison. No ports on the back of the 7390. Unlike the E7270 and most other laptops I’ve used, the power and volume buttons for the 7390 is located on the right side. I couldn’t find the power button at first and had to do an online search to find the power button. Another gripe I have about the 7390 is the keyboard. Compared to the E7270’s keyboard, the 7390’s keyboard feels smaller, and the keys just don’t feel as responsive. Maybe I just need some more time to get used to it. On the plus side, the 7390’s keyboard has backlighting which looks kinda cool and comes in handy when typing in a dark location. The screen and keyboard. The keyboard is pretty small. That’s all I have to say about my unexpected new laptop. Moving my files and reinstalling all of the old software only took one night, and it was pretty straight-forward and painless. Since this was a warranty exchange, I had to ship the E7270 back to Dell, so the 7390 2-in-1 is the only laptop I’ve got now. Obviously I am happy about getting a free upgrade, and hopefully this new-ish laptop will last a long time.